Lather away impurities and add radiance with luxurious, salon-quality Nutriance shampoos. Rich Revitalizing Shampoo for normal to oily hair, or extra-care Mild Revitalizing Shampoo for dry, fragile, chemically-treated hair or sensitive scalp. Vitamin B3, Pro-Vitamin B5 (Panthenol), plus selected botanicals combine to effectively cleanse, nourish and add shine, body and manageability. Your hair and scalp will feel clean and revitalized every time you pamper them with these gentle cleansing formulas. To remove dust, dirt, perspiration, environmental pollutants, hairspray and other styling products that become trapped in your hair’s natural protective sebum layer, giving your hair a dull, drab appearance. To prevent a buildup of dirt and oils that can make your hair feel sticky and lifeless. To remove grime and environmental pollutants without damaging hair shafts and causing hair to become dry and unmanageable. To clean hair and completely rinse away dirt, so that no unwanted residue remains on hair or scalp. Why Nutriance Rich Revitalizing Shampoo? Ingredients: Water, Sodium Laureth Sulfate, Disodium Cocoamphodiacetate, Decyl Glucoside, Panthenol, Witch Hazel Distillate, Niacinamide, Citric Acid, Polyquaternium 10, Laureth-2, PEG-7 Glyceryl Cocoate, Fragrance, Sodium Benzoate, Sodium Methylparaben, FD&C Yellow No. 5, FD&C Yellow No. 6, Sodium Chloride. Thorough cleansing of hair without stripping essential moisture, provided by a synergistic extra-mild multi-cleanser system. Natural Witch Hazel is added to assist removal of greasy hair buildup. Enriched with Vitamin B3 (Niacinamide) and Pro-Vitamin B5 (Panthenol) to help maintain natural moisture balance and give hair added body and lustre. Effective and thorough enough to clean and refresh even the most challenging head of hair, yet gentle enough to use daily. Gentle, free-rinsing formula leaves hair vibrant and easy to manage. Water soluble formula helps maintain a healthy hair and scalp pH. A fresh, clean fragrance your whole family is sure to love. High quality fragrance components have a pleasing, subtle aroma that never overwhelms. 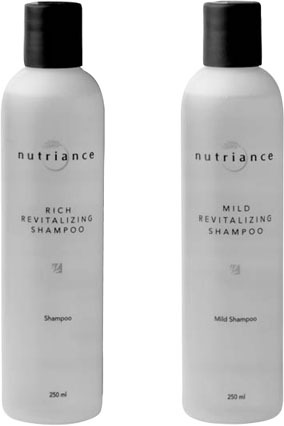 Why Nutriance Mild Revitalizing Shampoo? Ingredients: Water, Sodium Laureth Sulfate, Disodium Cocoamphodiacetate, Decyl Glucoside, Aloe Vera Gel, Matricaria Extract, Panthenol, Niacinamide, Polyquaternium 10, Laureth-2, PEG-7 Glyceryl Cocoate, Fragrance, Citric Acid, Sodium Benzoate, Sodium Methylparaben, Propylene Glycol, FD&C Yellow No. 6, FD&C Yellow No. 5, FD&C Blue No. 1. Thorough cleansing of hair without stripping essential moisture, provided by a synergistic extra-mild multi-cleanser system. Enriched with Vitamin B3 (Niacinamide) and Pro-Vitamin B5 (Panthenol) to help maintain hair’s natural protective lipid balance and give hair added body and lustre. Botanicals, including Aloe Vera Gel and Chamomile, add to the soothing and refreshingly rich lather.